Goodlife2 chasing us down the bay. Saturday's offshore race started at at 1100 h from Soldiers Point and followed the main channel down to the heads of Port Stephens with about 8 yachts competing.....double the number expected . 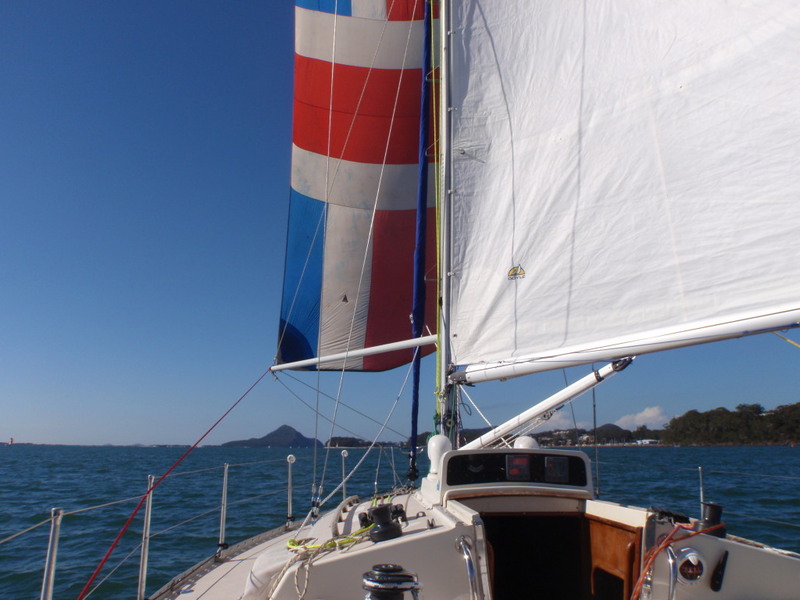 Once clear of the coast we headed north to complete a loop of three islands (Cabbage Tree Is, Little Is and Boondlebah Is) then back to Fly point at Nelson Bay for the finish (17M). The forecast 10-15 knot NW breeze failed to appear and was replaced with a light 5-10 knot WSW. Exalte (X-332) was again favourite and crossed the start line first. RW also had a good start with Eric the autopilot on the job as I played decky hoisting the Assy to be second across the line. We held out Escapade (Nolex 30) until Corlette when they snuck past out of the main incoming tide whilst Kiska (tri) gybed their way downwind. I had the Assy poled out running close to dead downwind and then had to gybe ......it was a bit like slow motion! Unfortunately the full spinnaker boats pulled away and RW just kept in front of Goodlife2 (Beneteau) all the way out to the heads. During my next gybe under Yaccaba Head, the spinnaker wrapped around the furled headsail gripping the sunbrella material like velcro and it wouldn't let go without disconnecting the tack and clew. Made for some good entertainment for the Goodlife2 crew as they slipped past on the way to Cabbage Tree Is (CTI)...... but not for long. Once I had the problem sorted, RW was back on the breeze and with good speed andwe soon passed Goodlife2 on a beam reach, quickly opening up a half mile gap. Altering course around Cabbage Tree Is the breeze dropped, so down came the Assy which I repacked ready for the next launch. The breeze finally backed to the South as forecast and increased to 10 knots so we picked up speed under headsail extending the gap. After a beat to Boondlebah Is we shaped course for Tomaree Heads......but not to close so we didn't fall into a wind hole. At that stage RW was also gaining on the leaders but so was Escapade and they blasted away catching the leaders as they floundered in another wind hole. Hoisted the Assy once the breeze dropped and backed and I managed to hold it in a tight reach all the way to 60 deg. Flew the Assy in a fading 5-7 knots breeze until 500m from the finish line at Fly Point then down again and back to the headsail. SOG was an impressive 1.9 knots!! Despite the lack of breeze it was a great day on the water with several whale sightings; and a podium finish for Rogue Wave. With only four races in the series its great to be in a good position early. 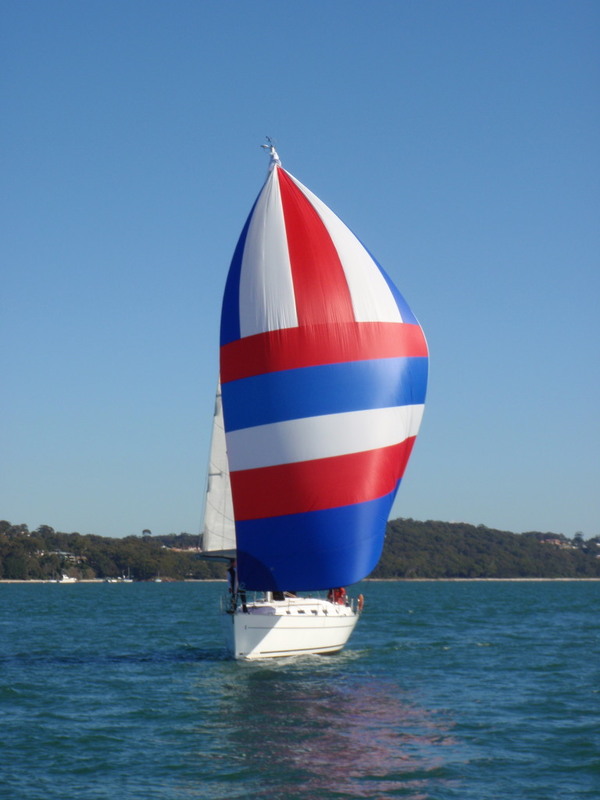 I think with arrival of our practice light air spinnaker next week and the two new spinnakers due by the end of the month, we should be able to pull a couple of races out of the bag and improve our red wine selection for the crew Christmas Dinner! It must be time to hit the pavement again as I felt a little stuffed after the race! Unfortunately the inshore racers did not fare so well and their race had to be abandoned. you had time to take photos?? ha ha ha - well done! !